SOUTHERN UTAH – A cold front is expected to push through Utah late Sunday night through Tuesday, bringing with it periods of road snow across the state’s valleys and mountains, including the Interstate 15 corridor from the Idaho border through Cedar City. The National Weather Service has issued a winter storm warning for a large portion of the state, including parts of Southern Utah, effective late Sunday night through Tuesday at noon. Regionally affected areas include the state’s southern and central mountains. Communities in the southern half of the state most likely to be affected by the storm include Cove Fort, Koosharem, Fish Lake, Loa, Panguitch and Bryce Canyon. Heavy snowfall is expected to produce between 10-20 inches, with greater amounts possible in some areas. High winds with gusts as high as 50 mph are also expected. Mountain roads throughout the state will experience snow showers Monday night, prolonging the period of hazardous road weather conditions into Tuesday morning. These conditions could make travel very difficult on all roads in the storm watch areas. Interstate 15 from the Idaho border south to Cedar City. Interstate 70 from east of Cove Fort to Fremont Junction; and Crescent Junction to the Colorado border. U.S. Route 191 from Wyoming to Price; and Crescent Junction to Blanding. All other routes in the central, southern and Wasatch mountains. The National Weather Service advises drivers to plan on low visibility and slippery and snow-packed road conditions across all high-elevation roadways. Be aware of road conditions. 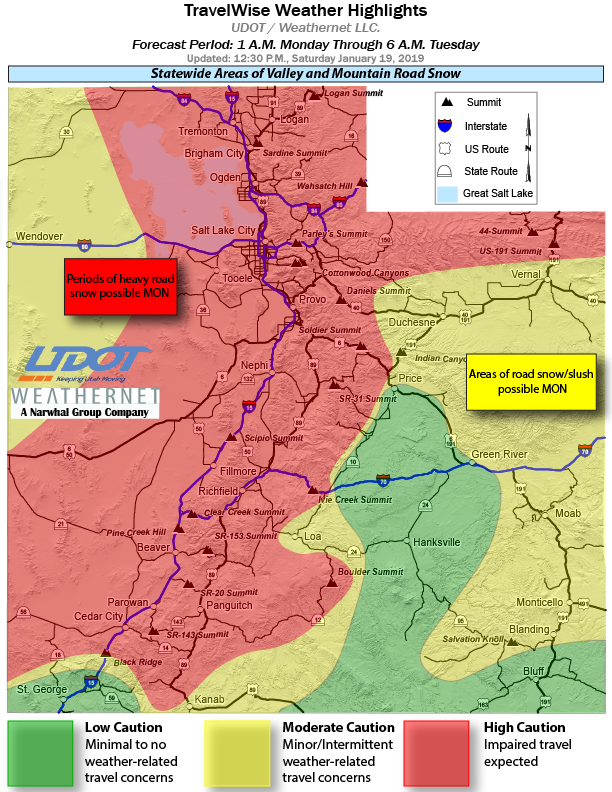 UDOT recommends checking CommuterLink for road and weather conditions before leaving home. Clear any frost and snow from the car’s lights and windows. Make an effort to see and be seen while driving. Inspect the vehicle’s tires, fluids, wiper blades, lights and hoses. Preventative maintenance may save a car from breaking down and stranding drivers and passengers on the highway. Allow for leeway in travel time. Expect to drive slowly in adverse weather conditions. High speeds can lead to skidding off the road and getting stuck in the snow. Have emergency supplies in the car. A basic winter emergency kit may include items like a flashlight, batteries, snacks, water, gloves, boots and a first-aid kit. Take it slow. Drive well below posted speed limits and leave plenty of space between cars. Approach intersections, off-ramps, bridges and shaded areas slowly. These areas are hot spots for black ice. Slow down in cases of limited visibility and be alert. Whether someone drives an elevated SUV or a ground-kissing Toyota Prius, again, UDOT says to take it slow. Just because a truck has 4-wheel drive doesn’t change how it handles on the road, especially when traction goes out the window. Mother Nature is no respecter of automotive diversity. Keep the vehicle’s speed down. The faster the car goes, the longer it takes to stop. Be slow on the accelerator or risk having the car skid when the next stop sign appears. Do not use the car’s cruise control while ice and snow still abound. Weather watches, warnings and advisories issued by the National Weather Service Forecast Office in Salt Lake City can be found here.